This is the cake for the ordinary Filipino. 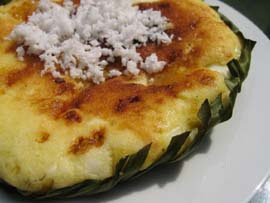 It's delicious and is always present in every Pinoy special occasions. Extract the milk from the mature coconut with the water. Sift the malagkit flour in a bowl and add molasses and coconut milk. Blend well with a mixing spoon. Line the native baking pan with banana leaves and pour in the mixture. Bake for about 40 minutes. For a variation, add a cup of sesame seeds or a cup of peanuts to the basic recipe. Serve with shredded coconut on top.